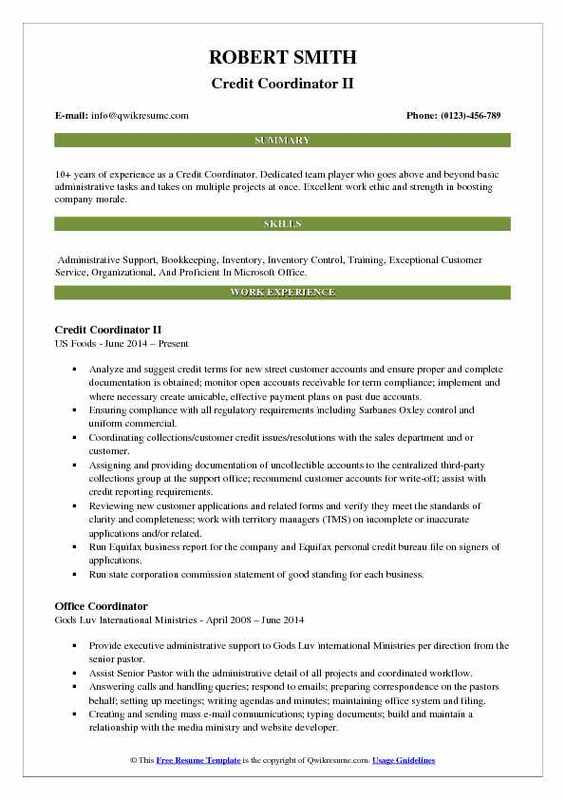 Credit Coordinator is responsible for supporting the organization in its credit program activities including processing customers and recording credit applications or transactions. 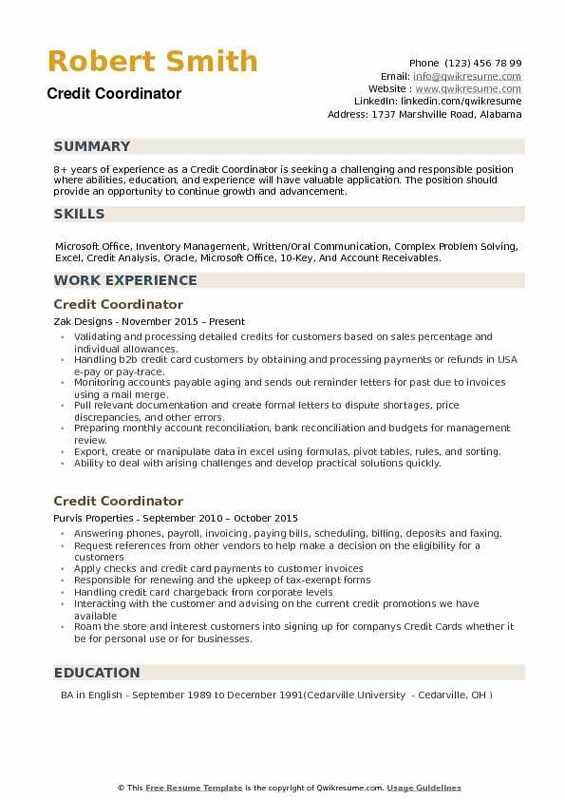 The common duties found on successful Credit Coordinator Resume include – training associates on credit procedures and policies, maintaining adequate supplies of signage and credit card materials, organizing promotions, reviewing and completing credit tasks, greeting clients and giving a quick response in a professional manner. They should possess excellent knowledge of credit processing system, have a solid understanding of risk assessment and financial concepts, these coordinators should also be well-versed in basic arithmetic calculations as the job is about calculations and dealing with a large amount of data. 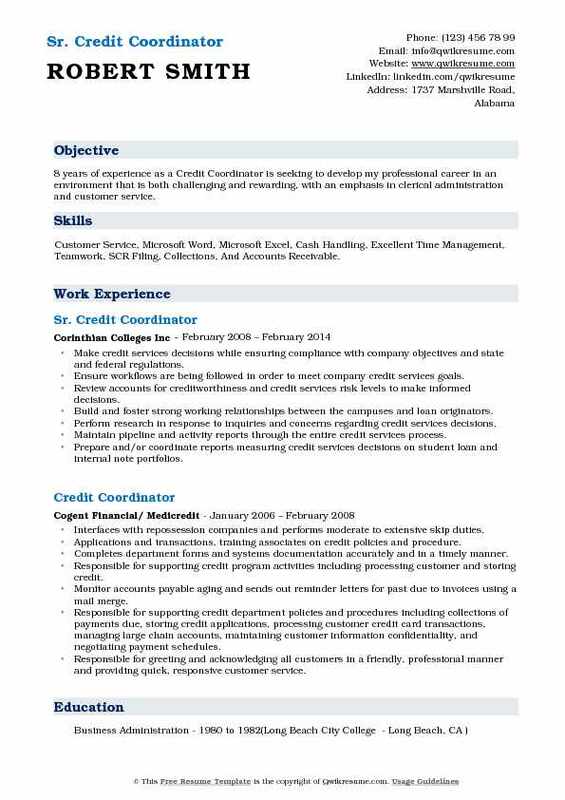 Credit coordinators normally come from varying backgrounds and have commonly a degree in the related field. Additional qualification is, however, an asset. Objective : Credit Coordinator with experience of 4+ years who excels at prioritizing, completing multiple tasks simultaneously and following through to achieve project goals. Seeking a role of increased responsibility and authority. Skills : Payroll, Credit, Accounts Payable/Receivable, CRM, Sales, Microsoft Office Suite, Negotiation, Interpersonal Skills, And Financial Management. Keeping track of all the credit applications, track how much money is coming in each week run a report, stay up to date on all credit promotions, make sure employees are up to date on promotions, take down expired signage, make sure everyone is trained in processing applications, sell all returned special order items that we are unable to receive credit on. Ensuring all product has a location and that it is specified on the report, research special order items that have been returned and be able to explain their history. Weekly report on all special order items located in the building, make sure they are in the correct location. Making sure all credit brochures are up to date, order replacements, and etc. Receive sold folders, process folders, make sure the product is in the store if the product is not in the store. Make sure order has been placed, notify installers when installs and/or details have been sold, follow up with installers to make sure they have been in contact with the customer to get them scheduled. Notify installers once special order items have come in, contact the customer when jobs sell to thank them for their purchase, keep customer up to date on special orders (estimated arrival date), follow up with the customer after the job is complete, address any issues and/or concerns customer may have. Submit work orders to installers if a problem occurs, pay installers for installs/details once completed, take the product out to the installer if needed to get the install completed. 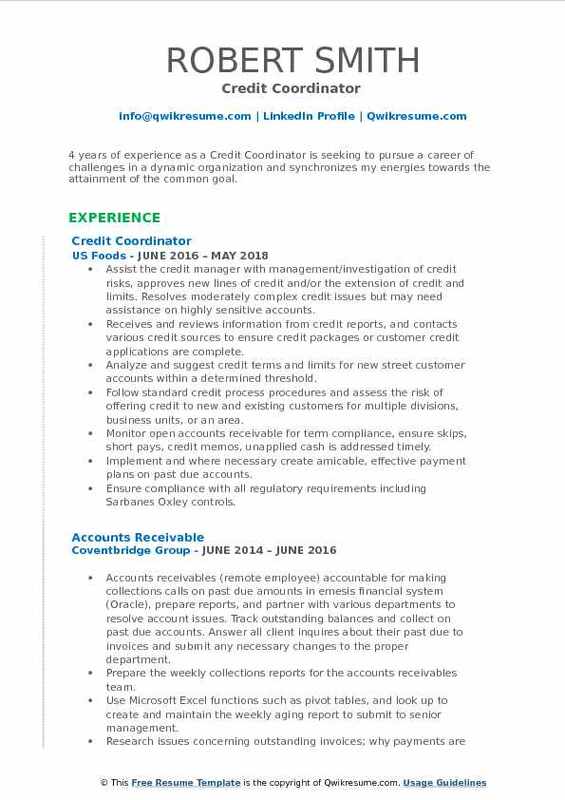 Summary : 12 years of experience as a Credit Coordinator is seeking a rewarding position with potential to grow in a firm that allows my strong communication skills and business acumen to thrive. Skills : Advanced Mathematics, Computer, Interpersonal Skills, Customer Service, Order Management, Speed Typing, Reading, Writing, Drawing, And Punctuality. Oversee and direct front end operations and cashiers, returns department, customer service department, and cash office. Planned and executed promotional events increase credit accounts to new customers. Investigated any necessary information for billing/credit discrepancies as they pertained to margin loss, shrink and credit chargebacks. Liaised with the administrative senior manager for weekly resale walks and PO discrepancies. Assisted customers over the phone regarding store operations, product, promotion, and orders. Created and administered monthly cart test to cashiers to reinforce the core responsibilities of the position. 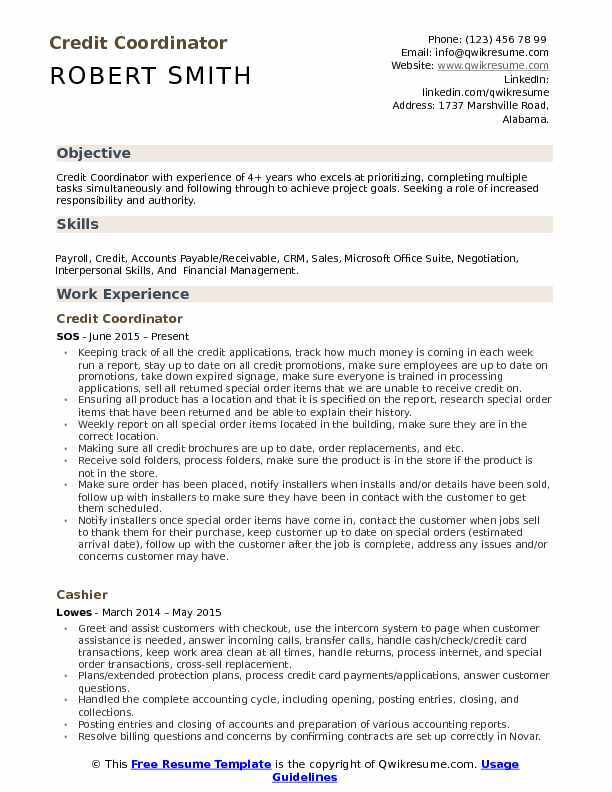 Summary : 10+ years of experience as a Credit Coordinator. Dedicated team player who goes above and beyond basic administrative tasks and takes on multiple projects at once. Excellent work ethic and strength in boosting company morale. Skills : Administrative Support, Bookkeeping, Inventory, Inventory Control, Training, Exceptional Customer Service, Organizational, And Proficient In Microsoft Office. Analyze and suggest credit terms for new street customer accounts and ensure proper and complete documentation is obtained; monitor open accounts receivable for term compliance; implement and where necessary create amicable, effective payment plans on past due accounts. Ensuring compliance with all regulatory requirements including Sarbanes Oxley control and uniform commercial. Coordinating collections/customer credit issues/resolutions with the sales department and or customer. Assigning and providing documentation of uncollectible accounts to the centralized third-party collections group at the support office; recommend customer accounts for write-off; assist with credit reporting requirements. Reviewing new customer applications and related forms and verify they meet the standards of clarity and completeness; work with territory managers (TMS) on incomplete or inaccurate applications and/or related. Run Equifax business report for the company and Equifax personal credit bureau file on signers of applications. Run state corporation commission statement of good standing for each business. Create reports using us foods systems to include Tandem, Dart, and ISR retrieval invoice and excel. 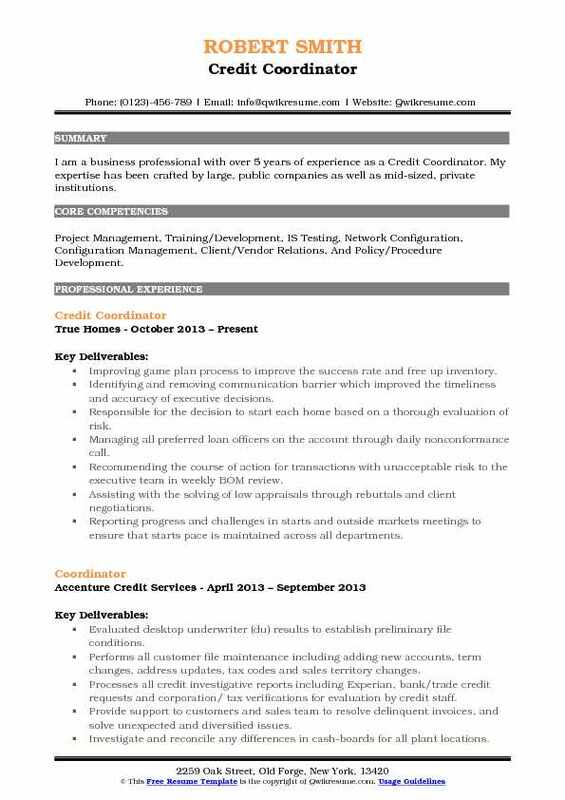 Objective : 4 years of experience as a Credit Coordinator is seeking to pursue a career of challenges in a dynamic organization and synchronizes my energies towards the attainment of the common goal. Skills : DSO, Credit Card, AR, Sales, Negotiation, Financial Management, Linux., Mac, Microsoft Office, MS Office, CRM, IRP, SPSS, Ratio Analysis, Cost Accounting, And Financial Analysis. Assist the credit manager with management/investigation of credit risks, approves new lines of credit and/or the extension of credit and limits. Resolves moderately complex credit issues but may need assistance on highly sensitive accounts. Receives and reviews information from credit reports, and contacts various credit sources to ensure credit packages or customer credit applications are complete. Analyze and suggest credit terms and limits for new street customer accounts within a determined threshold. Follow standard credit process procedures and assess the risk of offering credit to new and existing customers for multiple divisions, business units, or an area. Monitor open accounts receivable for term compliance, ensure skips, short pays, credit memos, unapplied cash is addressed timely. Implement and where necessary create amicable, effective payment plans on past due accounts. Ensure compliance with all regulatory requirements including Sarbanes Oxley controls. Assist the credit manager to assign and provide documentation of uncollectible accounts to the centralized third-party collections group at the support office; recommend customer accounts for write-off. Coordinate collections/customer credit issues/resolutions with the sales department and or customer. Summary : Over 12+ years experience in Credit Coordination.Special skills in written and verbal communication, and active listening. A structured, detailed, and result oriented professional who performs well in teams as well as independently. Investigate and resolve customer billing disputes and inquiries in a professional and timely manner. Working with the credit representatives, sales teams, and customers to identify and resolve revenue recognition issues. Log all notices sent to the sales teams, and provide monthly reports to appropriate management. Coordinating the efficient and accurate setup of new customer records in SAP credit master in order to ensure that customer orders are processed and shipped in a timely manner. Verify account set up with the customer when there are discrepancies, and work the customer master data team to resolve any errors. Respond to incoming requests for information from internal and external customers via telephone, email, and electronic fax. Assisting with internal and external audits, by researching order and payment history, as well as providing any necessary documentation. Create, analyze, and distribute various weekly, monthly, and quarterly reports. Ensure reports are compliant with all sox requirements. Acting subject matter expert for the allowance for doubtful accounts reporting. Initiating changes that contributed to improving the efficiencies of the bankruptcy and collection bad debt recovery process, the QED special terms pre-approval process, as well as the PO change process flow for archived billing documents. Reduced the time required for various monthly and quarterly reports by utilizing excel skills to automate certain aspects of the reports. Allowance for doubtful accounts - 50% reduction, quarterly QED special terms approvals - 75% reduction, and monthly a/r goals - 75% reduction. Summary : 8 years of experience as a Credit Coordinator is seeking to develop my professional career in an environment that is both challenging and rewarding, with an emphasis in clerical administration and customer service. 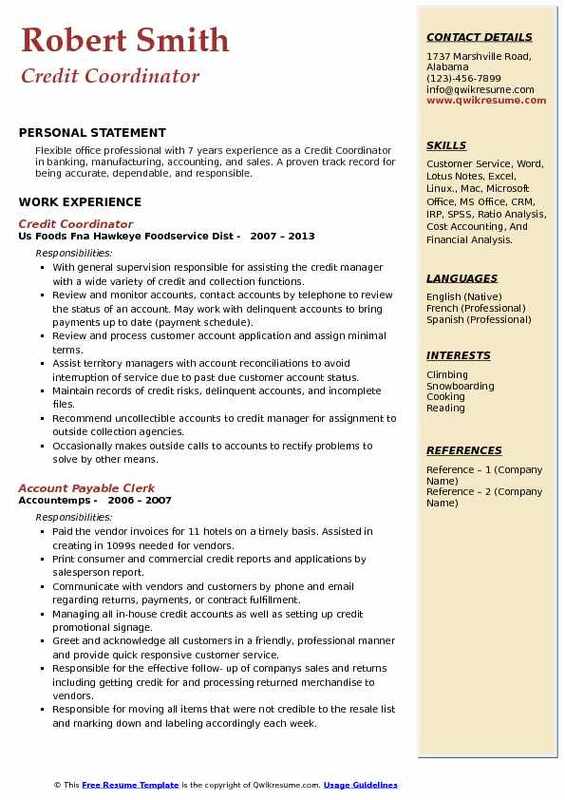 Skills : Customer Service, Microsoft Word, Microsoft Excel, Cash Handling, Excellent Time Management, Teamwork, SCR Filing, Collections, And Accounts Receivable. Make credit services decisions while ensuring compliance with company objectives and state and federal regulations. Ensure workflows are being followed in order to meet company credit services goals. Review accounts for creditworthiness and credit services risk levels to make informed decisions. Build and foster strong working relationships between the campuses and loan originators. Perform research in response to inquiries and concerns regarding credit services decisions. Maintain pipeline and activity reports through the entire credit services process. Prepare and/or coordinate reports measuring credit services decisions on student loan and internal note portfolios. Work closely with loan originators in reviewing, structuring, and quoting loan submission requests, including the issuance of application. Summary : I am a dedicated, hard-working individual with 11+ years of experience as a Credit Coordinator in a smooth-running office environment. I offer experience in a variety of office tasks, including customer relations and the various aspects of bookkeeping- pay- roll, accounts payable and recievable, etc. Skills : Data Analytics, Excel Expert, Customer Service, Research, Leadership, SAP Super User, Accounting, Professional, Ethical, Reliable, Organized, And Deadline-Oriented. Responsible for credit renewal of all accounts $150k and below, as well as set up of all new accounts. Managing email distribution and maintained updates for all Panasonic accounts. Coordinating and delegating assignments to credit analysts; follow up on progress. Preparing monthly reports of new accounts, department activity, and tax exemption certificates. Research, gather and prepare all necessary documents for state tax audits. New account, change account, over lines, customer master changes, letter of credits and other parameters. The request, secure and file UCC security agreements, renewals, and terminations of UCC filings. Took care of telephone inquiries and manage all written correspondence. Prepared credit approval summaries on new clients for credit by dun and Bradstreet. 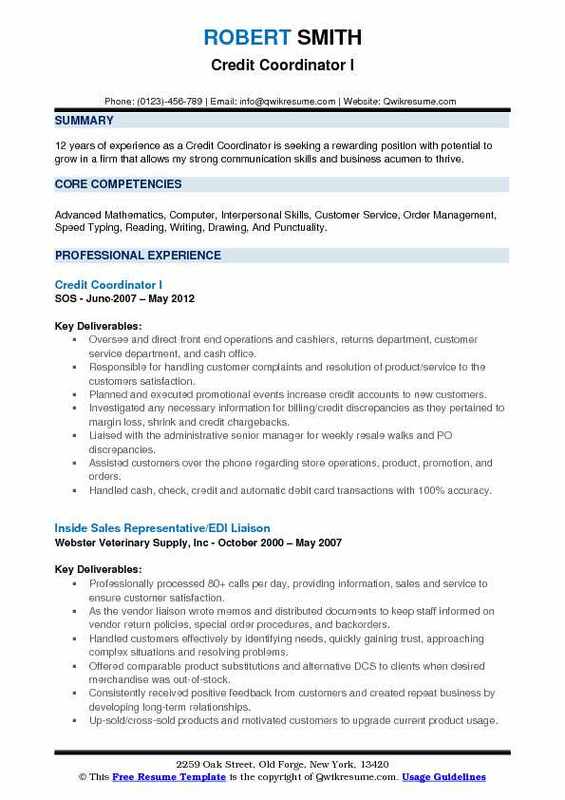 Headline : I am a business professional with over 5 years of experience as a Credit Coordinator. My expertise has been crafted by large, public companies as well as mid-sized, private institutions. Skills : Project Management, Training/Development, IS Testing, Network Configuration, Configuration Management, Client/Vendor Relations, And Policy/Procedure Development. Improving game plan process to improve the success rate and free up inventory. Identifying and removing communication barrier which improved the timeliness and accuracy of executive decisions. Responsible for the decision to start each home based on a thorough evaluation of risk. Managing all preferred loan officers on the account through daily nonconformance call. Recommending the course of action for transactions with unacceptable risk to the executive team in weekly BOM review. Assisting with the solving of low appraisals through rebuttals and client negotiations. Reporting progress and challenges in starts and outside markets meetings to ensure that starts pace is maintained across all departments. 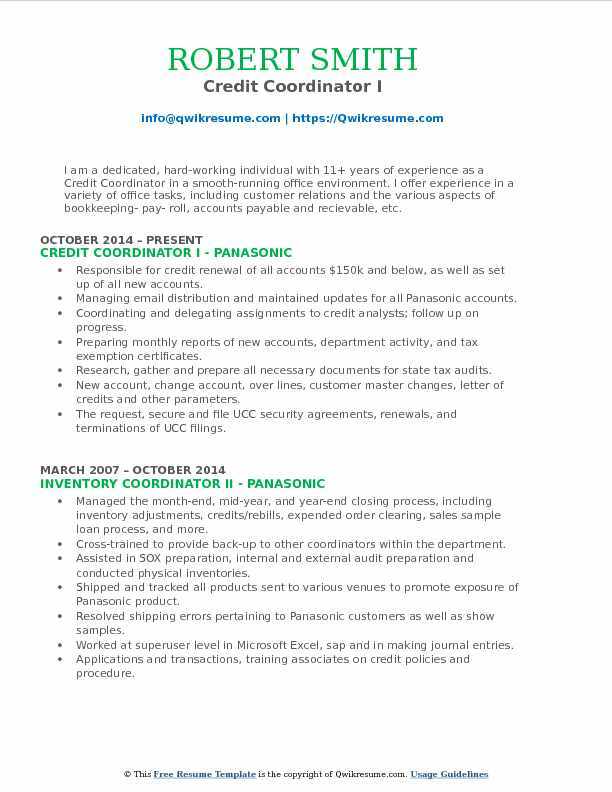 Summary : Flexible office professional with 7 years experience as a Credit Coordinator in banking, manufacturing, accounting, and sales. A proven track record for being accurate, dependable, and responsible. Skills : Customer Service, Word, Lotus Notes, Excel, Linux., Mac, Microsoft Office, MS Office, CRM, IRP, SPSS, Ratio Analysis, Cost Accounting, And Financial Analysis. With general supervision responsible for assisting the credit manager with a wide variety of credit and collection functions. Review and monitor accounts, contact accounts by telephone to review the status of an account. May work with delinquent accounts to bring payments up to date (payment schedule). Review and process customer account application and assign minimal terms. Assist territory managers with account reconciliations to avoid interruption of service due to past due customer account status. Maintain records of credit risks, delinquent accounts, and incomplete files. Recommend uncollectible accounts to credit manager for assignment to outside collection agencies. Occasionally makes outside calls to accounts to rectify problems to solve by other means. Summary : 8+ years of experience as a Credit Coordinator is seeking a challenging and responsible position where abilities, education, and experience will have valuable application. The position should provide an opportunity to continue growth and advancement. 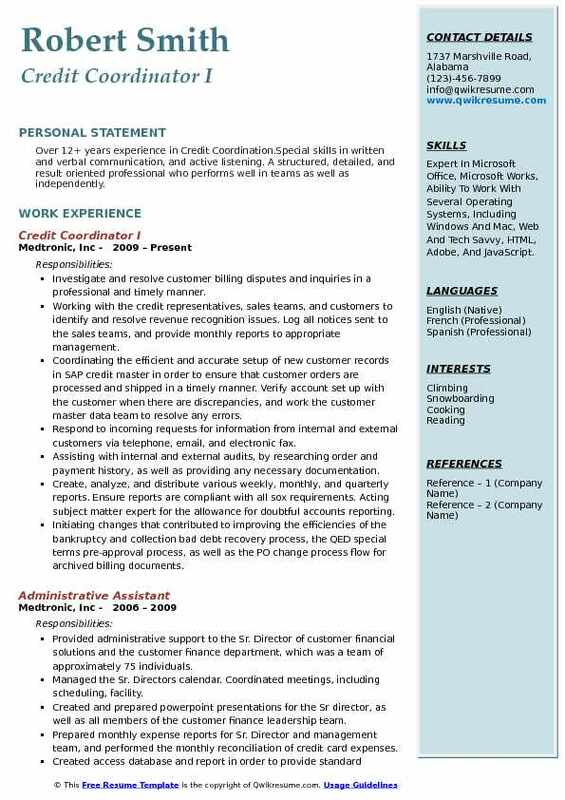 Skills : Microsoft Office, Inventory Management, Written/Oral Communication, Complex Problem Solving, Excel, Credit Analysis, Oracle, Microsoft Office, 10-Key, And Account Receivables. Validating and processing detailed credits for customers based on sales percentage and individual allowances. Handling b2b credit card customers by obtaining and processing payments or refunds in USA e-pay or pay-trace. Monitoring accounts payable aging and sends out reminder letters for past due to invoices using a mail merge. Pull relevant documentation and create formal letters to dispute shortages, price discrepancies, and other errors. Preparing monthly account reconciliation, bank reconciliation and budgets for management review. Export, create or manipulate data in excel using formulas, pivot tables, rules, and sorting. Ability to deal with arising challenges and develop practical solutions quickly.